KING RICHARD III LEICESTER SUNDAY LUNCH REVIEW - Sugar, Darling? I expected this review to be an easy one to write, but in fact it was quite the opposite. How many different ways can you say 'this was the best x that I have ever eaten'? 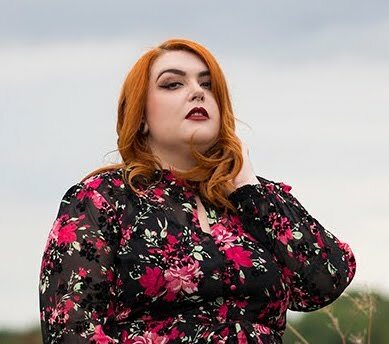 To be honest I expected KRIII to be fabulous, after all how could it not be when it has been opened by the team behind St Martins and Crafty - the only place I have featured twice on this website because it is just that good! 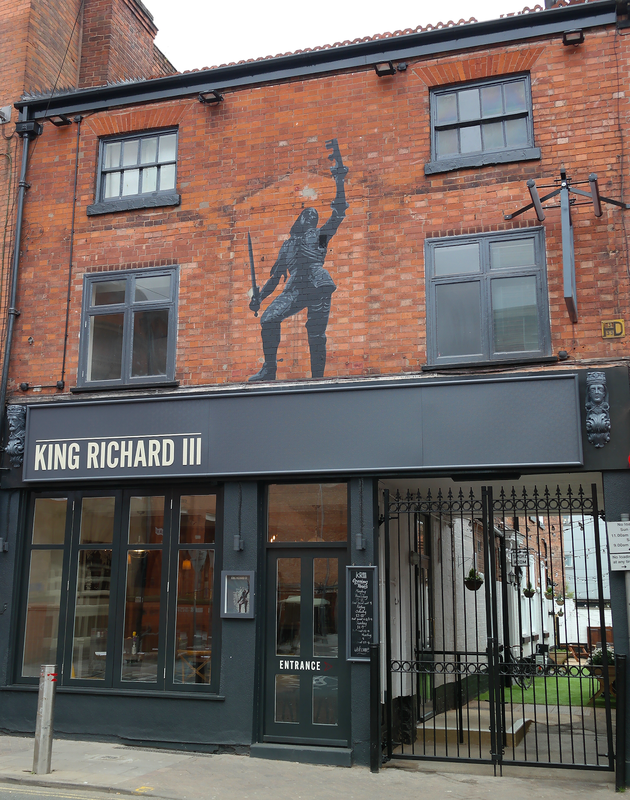 Thankfully to the fine folks of Leicester and visitors to this great city, they have indeed expanded their repertoire and taken over the old King Richard III pub on Highcross Street and giving it a complete renovation. I can't recall ever visiting the pub before their takeover so I can't comment on how big a change it has been although I'm told it is vast; but I can say that it is very beautiful now both inside and out with gorgeous original tiled floors, delightful art on the walls and a lovely serene colour scheme of sage green and cream. Head through the gates into the sweet little light festooned garden area and you'll find the main entrance taking you into the front seating area, the bar and then through to the main dining room. 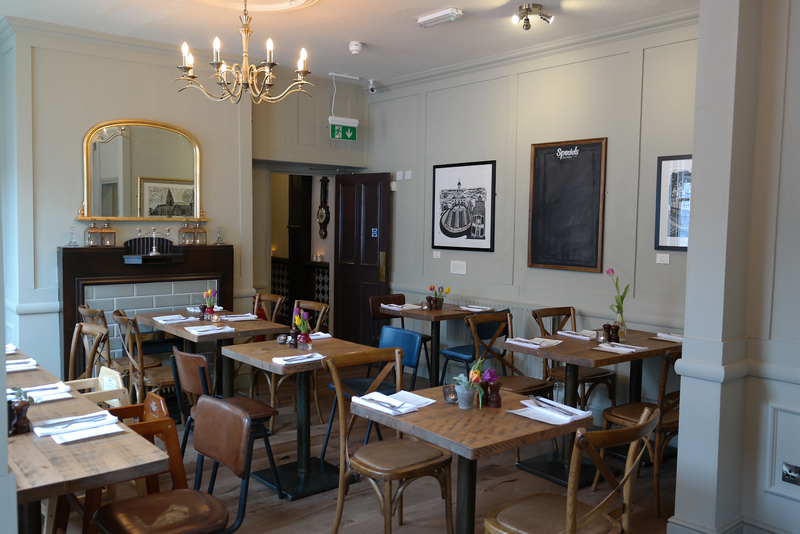 It's light and airy but cosy and calm - the perfect space for a wonderful meal. 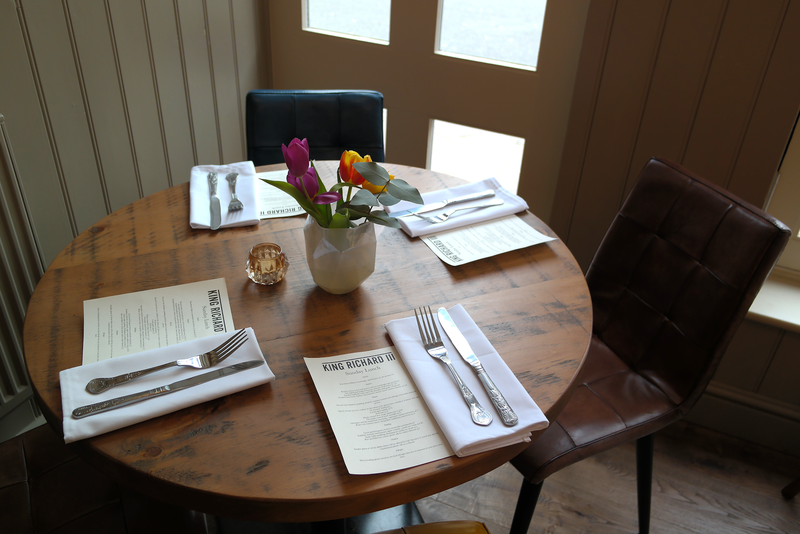 I actually booked our table a good few weeks ago after seeing the Sunday Lunch menu and it really was a perfect way to spend Easter. 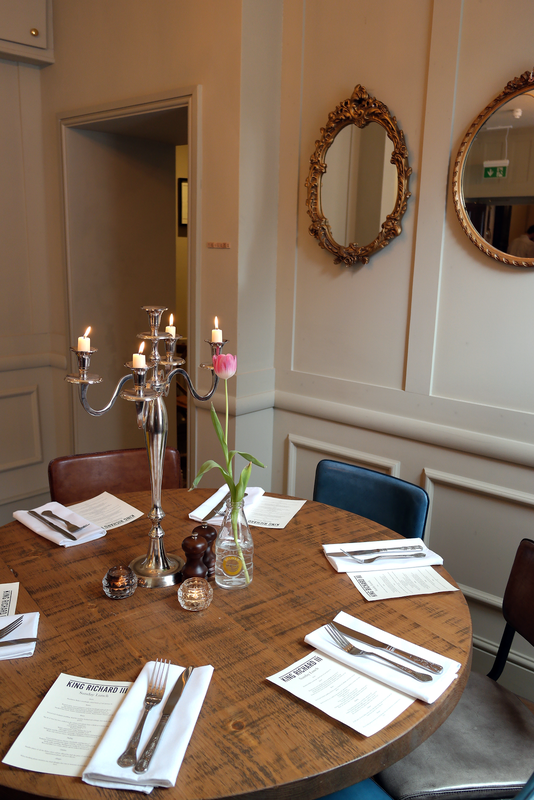 We were sat in the main dining room at a lovely corner table and started deciding what to drink. 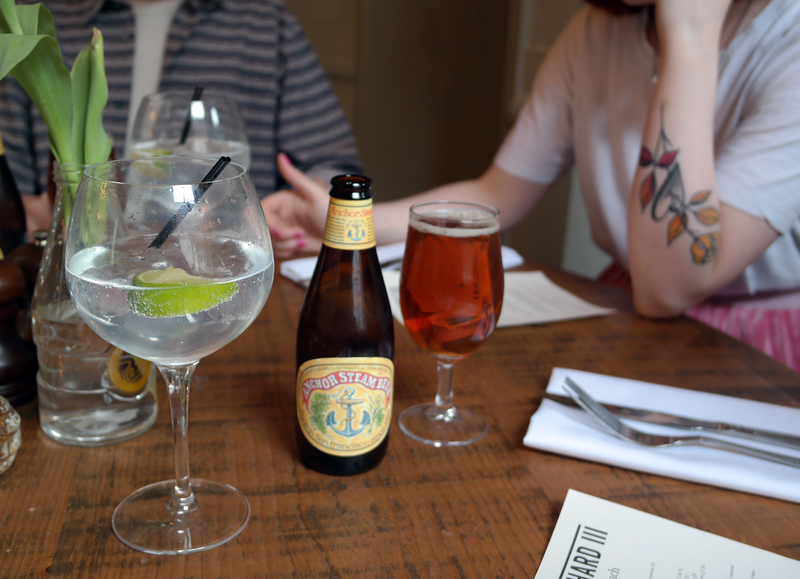 I was very pleased to see that the house gin was Burleigh's and my husband went straight for the Anchor Steam Beer of which he has a real fondness as it was what he drank throughout our wedding trip to San Francisco, but also as it is mightily delicious. As expected the wine list was also very well crafted and the beer selection impressive, both looking at quality over quantity. But now, on to the food! From the selection of starters I chose the salt baked and pickled beetroot, burrata and fresh herbs (£7.00). I was so pleased to see burrata on the menu as it is one of my favourite things and something I had only seen on menus in London until now. If you are unaware it is a fresh cheese with an outer shell of mozzarella filled with cream and stracciatella curd cheese and is an absolute dream. 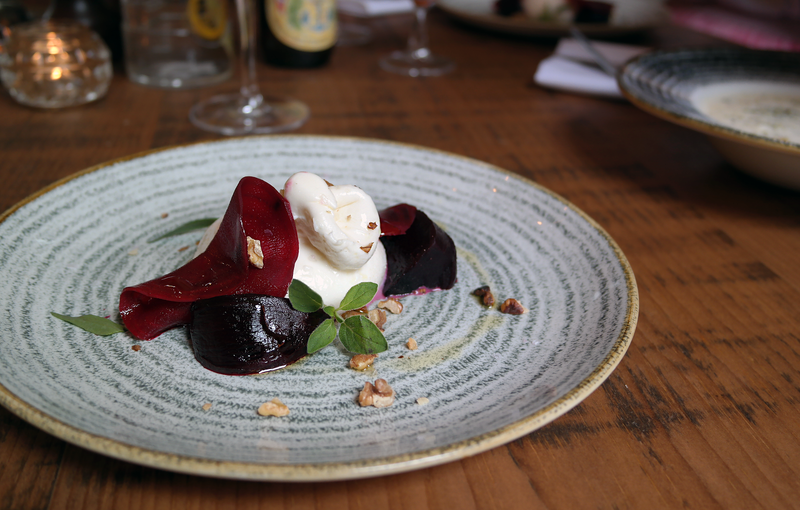 Served with tender roast beetroot and thin slices of pickled beets it was a wonderful start to the meal, with the fresh herbs and crunchy roasted hazelnuts contrasting perfectly with the rich cheese and beets. The only thing I can see that would have made it better is a drizzle of balsamic vinegar or more of the pickled beetroot to offset the creaminess, but it was still lovely without this. 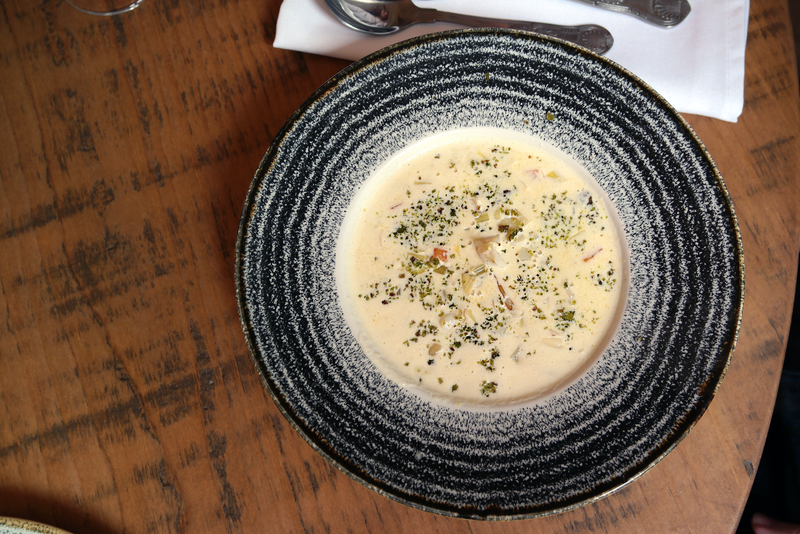 My husband went for the smoked haddock, clam and leek chowder with wild garlic crumb (£6.00) and I (barely) managed to steal a taste from him before it was all gone. I'm not surprised he wanted to keep it all to himself as it was absolutely divine! Decadently creamy yet light, with the delicate smokiness of the fish and the finely chopped vegetables with a final zing of freshness from the garlic and herb crumb. Definitely one of the very best soups I have ever tasted. 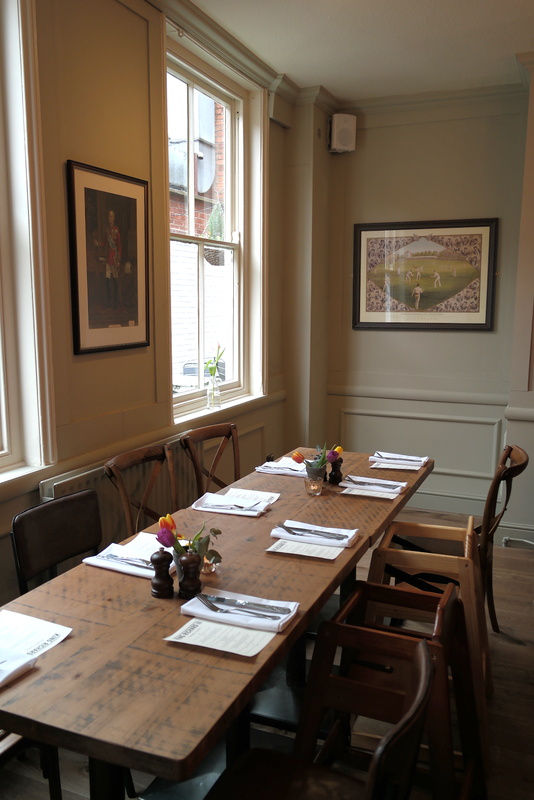 Three of us went for the same main course of overnight roasted lamb shoulder (£13.00) and it was truly superb. The portion was incredibly generous and cooked to perfection, tender and delightful with caramelised fat and a beautiful rich gravy. 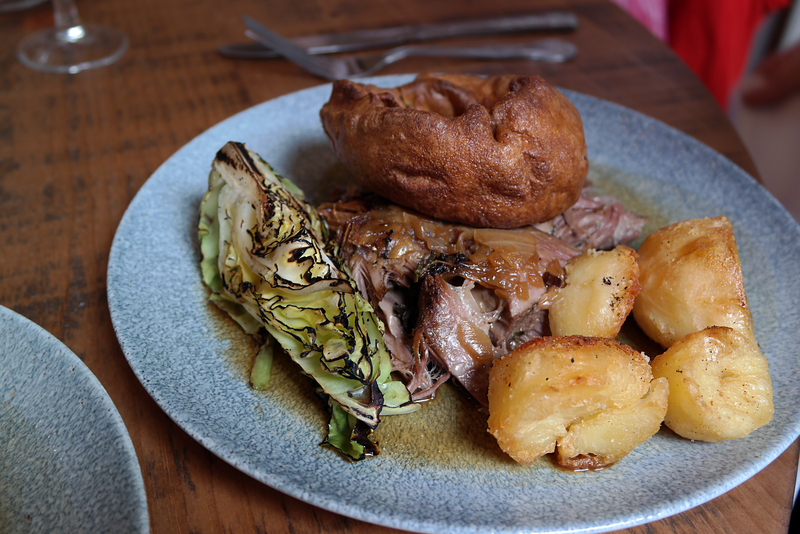 It was served with duck fat roasted potatoes, an impeccable yorkshire pudding and a wedge of slightly charred cabbage that has been grilled on the robata which was a superb addition. 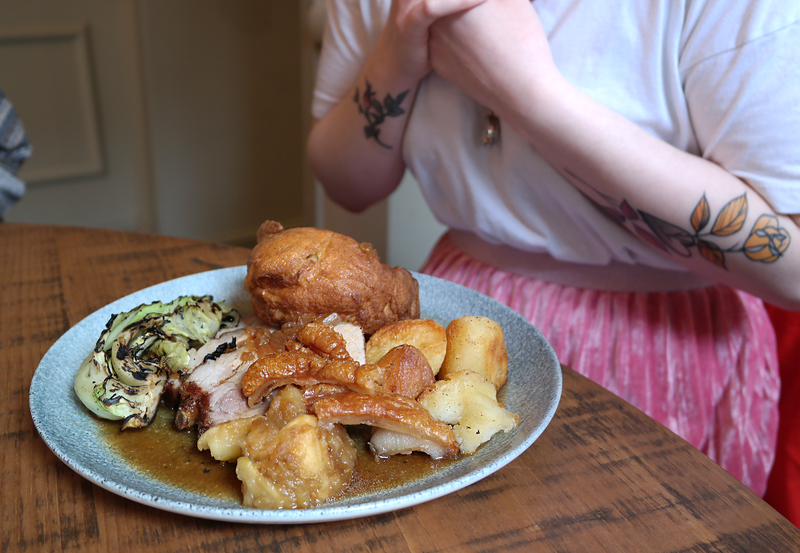 My sister decided upon the roast pork loin (£13.00) which she assures me was also wonderful and I must say looked so tender and juicy and came with a sumptuous pile of crispy crackling! All KRIII's meat is sourced from March House Farm in Melton Mowbray, all of whom's meat is reared and butchered by them and is renowned as being some of the best in the country. 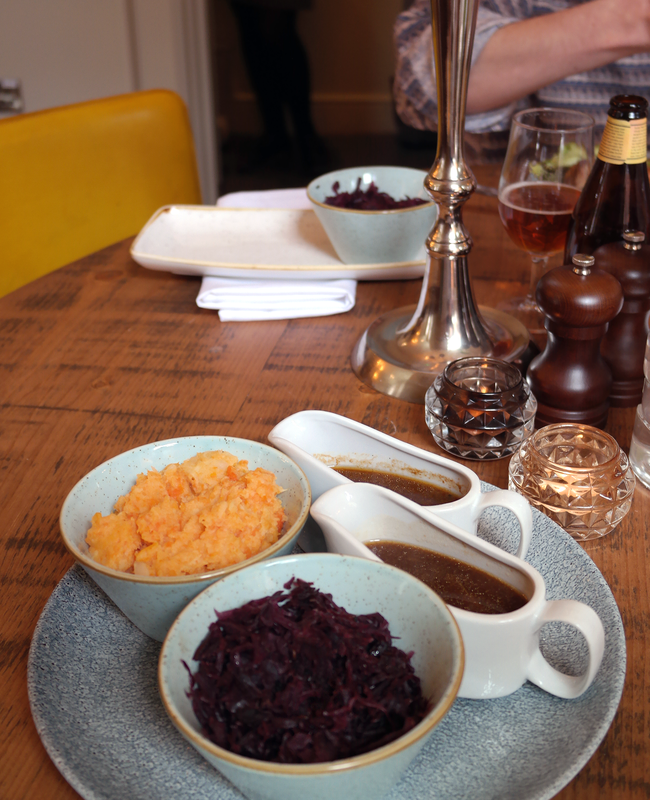 Alongside these already impressive plates came bowls of rich braised red cabbage, buttery root mash and jugs of extra gravy - always the tell tale sign of a well thought through roast dinner! I would go as far as to say this this was the best roasted lamb I have ever eaten. Not only that but the best roast dinner I have ever eaten, even beating my own which I have been perfecting for the last 10 years! We finished our meals with desserts and coffee despite already being full to bursting but we just couldn't resist the puddings. 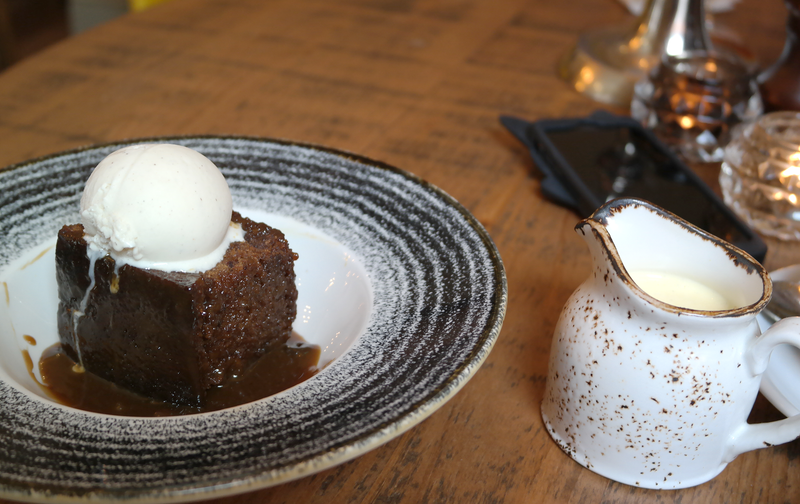 My sister's partner opted for the sticky toffee pudding with Madagascan vanilla ice cream (£5.00) which was just as rich as indulgent as it should be, warm and sticky with a scoop of perfectly cold and luscious ice cream. 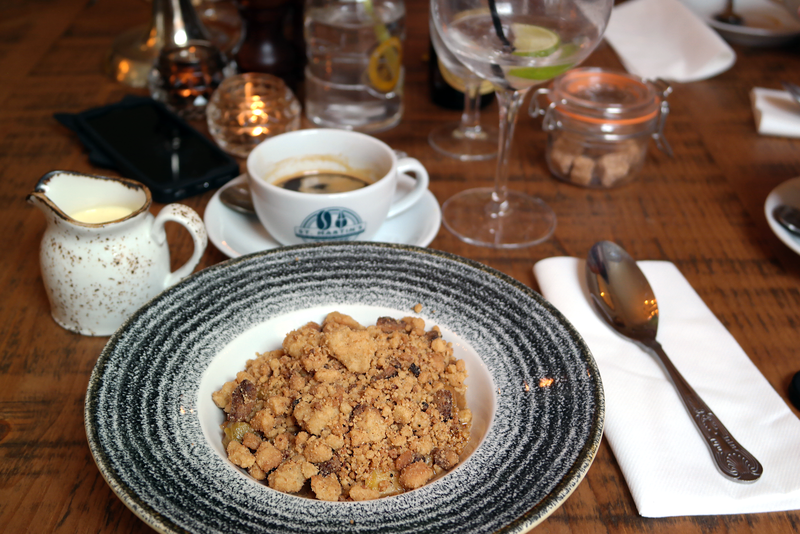 I chose the Yorkshire rhubarb and bramley apple crumble with vanilla custard (£4.50) and again this was a triumph with juicy chunks of apple, tangy yet sweet rhubarb and a generous topping of buttery sweet crumble. A lovely big jug of custard accompanied it which was smooth and unctuous and incredibly creamy yet not overly thick - the perfect custard! As you can tell we had a truly superb meal at KRIII that surpassed even our already high expectations and I am positive that we will be visiting many many more times in the future. We paid £30 each for this outstanding meal including our drinks which I believe is incredibly good value for money considering the high high quality of the food. I highly urge you to visit yourself as soon as you can - I may just see you there!